A press release from the office of Mayor Stephen Juba announcing two guests for the Pine to Palm Cavalcade, the Mayor of St. Paul, Minnesota and Minnesota State Governor Orville L. Freeman. A press release from the office of Mayor Stephen Juba regarding Better Hearing Week from May 16-22 1965. 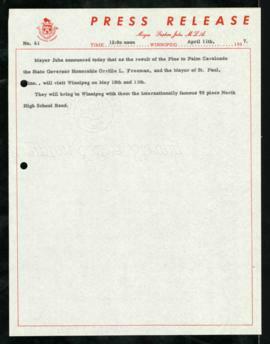 A press release from the office of Mayor Stephen Juba containing a copy of a telegram sent by the mayor to Prime Minister Louis St. Laurent on his 75th birthday. A press release from the office of Mayor Stephen Juba regarding a meeting of the Board of Police Commissioners. A copy of a press release from the office of Mayor Stephen Juba containing a letter sent to the Winnipeg Enterprises Corporation regarding the possibility of Winnipeg being home to the Canadian Football's Hall of Fame. A press release from the office of Mayor Stephen Juba containing a statement of resignation from Charles H. Spence from the Board of Police Commissioners. A press release from the office of Mayor Stephen Juba announcing the amalgamation of Charleswood into the City of Winnipeg.